Two prominent Israeli columnists ask: why are Israelis so eager to pitch in to the rescue effort in Haiti and yet show such little concern over the dire humanitarian crisis they’ve helped to create just a few kilometers away in Gaza? (The) remarkable identification with the victims of the terrible tragedy in distant Haiti only underscores the indifference to the ongoing suffering of the people of Gaza. Only a little more than an hour’s drive from the offices of Israel’s major newspapers, 1.5 million people have been besieged on a desert island for two and a half years. Who cares that 80 percent of the men, women and children living in such proximity to us have fallen under the poverty line? How many Israelis know that half of all Gazans are dependent on charity, that Operation Cast Lead created hundreds of amputees, that raw sewage flows from the streets into the sea? The disaster in Haiti is a natural one; the one in Gaza is the unproud handiwork of man. Our handiwork. The IDF does not send cargo planes stuffed with medicines and medical equipment to Gaza. The missiles that Israel Air Force combat aircraft fired there a year ago hit nearly 60,000 homes and factories, turning 3,500 of them into rubble. Since then, 10,000 people have been living without running water, 40,000 without electricity. Ninety-seven percent of Gaza’s factories are idle due to Israeli government restrictions on the import of raw materials for industry. Soon it will be one year since the international community pledged, at the emergency conference in Sharm el-Sheikh, to donate $4.5 billion for Gaza’s reconstruction. Israel’s ban on bringing in building materials is causing that money to lose its value. But what about the humanitarian disaster in our own backyard caused in a large part by our own doing? What about Gaza? More than 1.5 million people are living in total poverty, without sanitary drinking water, under an economic and physical siege, locked in what could easily be called the world’s largest prison. While we ask to see in all of the gory details, all of the destruction including hundreds of corpses on the streets of Port-au-Prince, we wish to see none of the human suffering of our Palestinian neighbors in Gaza where we literally hold the keys to the end of their suffering. This entry was posted in Gaza, Global Activism, Haiti, Human Rights, International Aid, Israel, Palestine on January 19, 2010 by Rabbi Brant Rosen. I don’t understand the question-what’s the comparison between the two situations? Haiti is a natural disaster. Gaza is in some difficulties because of actions their government has taken…starting a war with Israel and then losing it. NO ONE IS STARVING IN GAZA. There is no lack of medical equipment and drugs. The blockade is selective. When the Gazans stormed the border with Egypt in the Sinai last year, Gazans came to El Arish and other places they bought out the place…they had more money than the local Egyptians have and they have a highter standard of living even with the blockade than do the Egytians. The HAMAS government in Gaza insisting on firing rockets indiscriminately into Israel even after Israel pulled out completely from the Gaza Strip (Gush Katif) in 2005 and even had arranged for the high-tech agricultural facilities and other financial aid to be transferred to the Arabs there. This was their decision. Then HAMAS carried out a coup and took full control there and accelerated the attacks on Israel in addition to unilaterally abrogating the Oslo Agreements. It was then Israel imposed the partial blockade. This blockade and the sanctions against the Gaza gov’t of HAMAS has the support of most of the world’s governments including those in Europe which are not particularly friendly to Israel, and not to mention also the support of Egypt who also borders Gaza. If the people there are so miserable, why is the regime there spending so much of the resources they have on stockpiling weapons? It is preposterous, because Israel has no desire to reoccupy Gaza. They have brought their problems on themselves, so any comparison to Haiti is ludicrous. But you’re wrong about hunger in Gaza. There is mass, human-created hunger and under-nourishment, with hundreds of thousands of people dependent on international food agencies for their daily nutritional needs — needs that can’t always be met even by the agencies, because of Israeli controls at the border. For some time after last year’s war, and until American intervention forced Israel to change the policy, no pasta was allowed into Gaza (for instance). At one point, aid agencies couldn’t distribute food, because they had no plastic bags and Israel wouldn’t open the border to let supplies in. And not for nothing, but punishing an entire population of 1.4 million or so people because of the actions of its government (whatever one might think of those actions) is illegal, immoral, and counter-productive. It would be like firing rockets into southern Israel in response to Israel’s massive military actions against the Palestinian people. Which is to say: Neither is justified, each is wrong, and on both sides, the action tends to make people less willing to talk. But one side has had its society destroyed and its people reduced to hunger, and the other hasn’t. I reject the claim that there is a food crisis in Gaza. If there was, then there would be a massive outcry by “do-gooder” governments in Europe (e.g. the Scandinavians) about the situation, and there isn’t. There is no international pressure by governments on Israel to end the partial blockade because they understand the danger the HAMAS regime there poses. Israel is in a war situation with Gaza because the HAMAS regime there defines it’s relationship with Israel as such. They unilaterally abrogated the Oslo Agreements which define the relations between Israel and the Palestinian authorities and announced they will never agree to peace with Israel on any terms. 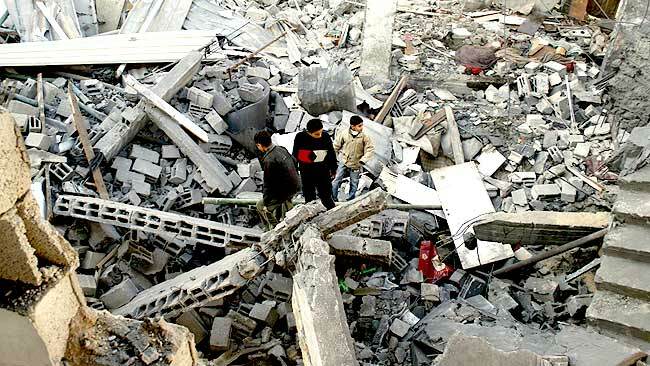 They even carried out numerous terrorist attacks on the crossing points where food and other cargo is shipped into the Gaza Strip, in addition to the indiscriminate rocket fire on Israel. Thus, the people may have to suffer, just as the German and Japanese people suffered in World War II for the crimes of their governments. Thank you for sending both of these out, Brant. I’ve been very encouraged to see both these writers putting this out so clearly and courageously. Because, finally, it’s Gaza that may open the eyes. Somehow, the West Bank, right across the street or in the backyard, has not accomplished this. Somehow, the people have been able to close their eyes, make themselves blind. But not Gaza. Not that prison, not that ghetto, not those walls. Perhaps it will be Gaza. As usual, kol hakavod my friend. Thank you again, Brant, for helping us to be informed. I think that we Americans and American Jews need to be careful when we are helping others and that we do not take an Orientalist approach by attempting to patronize the needy or to give to one cause to allow blindspots to remain for others (Gaza). Why do you attack Israel so brutally for sending aid to Haiti while you believe that they have their own humanitarian crisis in Gaza, whereas I see no one criticizing the United States for sending hundreds of millions of dollars of aid to Haiti when its response to Katrina, a crisis, in your eyes, of similar magnitude to that in Gaza, was as deplorable as you see Israel’s treatment of Gaza? This is a wonderful opportunity for you to talk about some of the positive things that Israel is doing in the world. I would encourage you to post this video and discuss. This is an interesting topic for conversation. After watching this CNN piece and reading the YNet interview with the Israeli disaster relief doctor (posted by Michael, above), what is your reaction? The doctor (who was relieved of his position by the IDF) claims that the field hospital was set up largely for PR purposes and that the more pressing need was for basic (and less “flashy”) needs such as water, sanitation, etc. Do you think the CNN clip is a puff piece, as Richard Silverstein claims on his blog? I’m very interested in folks’ thoughts on this point. I thought the piece was fine–a bit puffy, but nothing terribly upsetting. If there’s an ignoble motive behind the move, it’s still helping people and saving lives. I wish the UN were as eager to get good PR as the IDF. At times like this, there are plenty of pressing needs to go around. Putting aside the sarcasm, I honestly cannot believe the postings on this blog. The level of Israel bashing is sickening. The articles I posted here were written by two Israeli columnists who are generally considered to be part of Israel’s moderate – left. Do you believe their editorials constitute Israel-bashing? Gaza and Haiti are different situations to be sure, but it is sad to realize there is such human suffering in both and that the world is so intensely focused on the one and not the other. I am in no place to judge the motivation of the Israeli rescue team, but I am very aware that the same Israel that sent the team is blocking essential materials from entering Gaza and that in the long run this will make Israel less rather than more secure. Regrettably, these policies are training a whole new generation of Palestinians to hate Israel and that dehumanizes everyone. I do want to commend Brant and those who respond for the openness of this blog. It is obviously generating a lot of heat and maybe some light as well. This conversation makes it all the more obvious how important it is we find opportunities to listen to each other and to allow our assumptions to be challenged. That’s probably the greatest challenge of all. If some courageous Israelis and Palestinians can do it, surely we can too. The question of whether or not Israel is grandstanding is arguable — but not whether Israel needs to be called to account for its humanitarian crimes. Rather than take offense at the claims of grandstanding, Israel and its defenders must realize that in the face of the crime of Gaza, Israel must expect to experience this kind of attack in the court of public opinion. And that is how it should be. Attention to what Israel is doing in its own backyard outweighs any other considerations of what it may be accomplishing for good elsewhere, or, for that matter for its own citizens. That’s tough, but that’s the way it is, and that’s the way it should be. Of course we Jews should take pride over Israel’s efforts in Haiti – regardless of any possible ulterior motive. For my part, however, Akiva Eldar and Gershon Baskin represent that aspect of Israel of which I am most proud: courageous Israelis who are not afraid to voice the deeper, more painful, but infinitely more important questions. As a Jew, this is what truly makes me proud: learning about Israelis who are willing to go beyond simplistic nationalistic pride and point to a more complex reality: the disjuncture between Israel’s international relief efforts and the dire humanitarian tragedy that they themselves are causing right in their own backyard. It is human nature for our generosity to blind us to the demands that justice places upon us. One sees this in dealing with employers all the time, especially religious employers. The fact that they do so much philanthropy somehow hardens there resolve to resist their employee efforts to organize unions. Yep, it’s Israel bashing even if lefty Israelis do it. Unfortunately, it also why the left never takes power in Israel even though, in my opinion, it has the better answers on many issues including those around national security. It’s shocking but insulting Israel at every possible opportunity just isn’t that popular with most Israelis. The irony of self-proclaimed progressives and anti-imperialists failing to consult with actual Haitians or think about what they would want when discussing the morality of Israel’s rescue efforts is rather conspicuous. If we’ve actually reached the point in which Akiva Eldar and Gershon Baskin (individuals with obvious love and concern for the Jewish state) can be considered “Israel-bashers,” then all I can say is that Israeli society has reached a level of shamelessness that is truly tragic. The answer to your question is because one is a natural disaster that creates defenseless individuals who have NO government to support them now, while the other is a state (Gaza) whose people elected Hamas and is complicit with its leaders to wipe Israel off the map. Of course there is not 100% consensus in Gaza and surely there are victims of retribution, but I would say that a majority in Gaza do not want peace with Israel and will always look forward to a future time when Palestineans regain control of the entire land of Israel. With all due respect, we’ve been over this issue again and again on this blog. Your answer – that all Gazans are all simply complicit with the Palestinians who want to destroy Israel – is simply a rationalization for collective punishment. Not only is this immoral, it is not particularly effective. Continuing to squeeze the life out of Gaza will only make Israelis less safe in the short and long run. The bottom line is quite straightforward: Israel holds the key to the humanitarian well being of Gazans: end the blockade, negotiate with Hamas for a cease fire, the release of Schalit, etc, and support relief and development efforts. All the rest, I believe, is commentary. The “rest” is not just commentary. The “rest” is that whether or not ALL Gaza residents are responsible, the leadership is. Israel does not hold the only “key to the humanitarian well being of Gazans.” The leadership of any population bears the responsibility for their own well being. Isn’t this the first responsibility of any ruling party? What responsibility do you place on the Gazans themselves? Is it not the ultimate presumption to place that response – ability on any but their own shoulders. This is the essential point that I believe you have not addressed. In Haiti, no person or government is responsible for the devastation. An earthquake is. As far as I know, the Haitians have never fired any rockets into Israel. Perhaps that, more than anything else is responsible for the different reactions. I also don’t recall Haiti voting that Zionism is racism. Or Haitians dancing in the street when terrorist kill innocents. Perhaps that also has something to do with it. The leadership of any population bears the responsibility for their own well being. Isn’t this the first responsibility of any ruling party? Regardless about how you feel about Hamas, they will never have the opportunity to prove whether or not they can bear the responsibility for people’s well-being as long as a crushing blockade keeps essential goods and services from entering Gaza. Let’s look carefully and honestly at why the rockets are flying into Israel. Do you really believe that Hamas believes they can wipe Israel off the map with crude, unguided missiles? Could it be that there is another reason that they are firing these missiles – namely that they are resisting the oppression of a vastly more powerful party in this conflict? In truth, Palestinians have been attacking Israel from Gaza long before this latest crisis began, indeed, long before there was a Hamas. Their resistance dates back to the war of attrition in the 70s and even earlier, from the period immediately following the establishment of Israel. The reason, quite simply, is that they are an oppressed people, and oppressed people tend to resist their oppression – sometimes violently so. Yes, Palestinians also have a responsibility in this conflict. Saying I understand the reasons for their resistance does not mean to condone it when it is manifest violently. But I do believe that until we try to understand the context in which this violence occurs, we will never, ever begin to find a way out of this tragic mess. David answered the question of “why are Israelis so eager to pitch in to the rescue effort in Haiti” very succinctly and to the point. Thank you David. I’m not sure why I continue to read this blog. I guess maybe the reason is to check in –and make sure there are readers who continue to challenge your ideas, Brant. I am gratified to see that there are. I find your views very upsetting. To take the goodwill of a nation coming to the rescue of those devastated by an earthquake — and turn it into another rant against the state of Israel is beyond comprehension. Whether or not you choose to print this is up to you. At the very least, I’ll know that you have read my words. I disagree with your opinion here. To look honestly at the situation one must question several of your points. This is simply incorrect. How do you explain attacks by Palesineans on Jewish settlements in the Etzion block dating back BEFORE the creation of the state (1927). These were lands that were legally purchased and settled by Jews. To think that Palestinean violence occurred only AFTER the declaration of Israel, and therefore lay blame on Israel, is simply incorrect. Why does any terror group terrorize? Its not with an intention or realism that that particular act would provide imminent victory and destruction of the opposing country. As Fareed Zakaria in his newsweek editorial made clear after the attempted Christmas day bombing, the reason for terrorist attacks is to sow fear into its victims. That’s why Bin Laden has announced responsibility for planning this attack- despite a failure- he still celebrates its effect on us and declares the act a success in its own right. Hamas is not sending rockets into Israel with thoughts of wiping Israel off the map (but if they could with perhaps a nuclear missile they probably would) but to sow fear and is done not just in the name of “resistance”. Yes, we obviously we have a different view of history. The Etzion Bloc is not in Gaza, but if we’re going to talk about the genesis of this conflict in general, I would say this: we need to bear in mind that Arabs and Jews lived together in peace in Palestine (including Gush Etzion) for centuries. Tension between these two communities only truly began when Zionist settlement commenced with the expressed purpose of establishing Jewish sovereign control over the land. Under these circumstances, it was natural that there would be conflict with the Palestine’s ,indigenous inhabitants. Your claim “legally purchased” is misleading. Yes through the turn of the century, Zionist settlers bought up land throughout Palestine, predominantly from Arab absentee landlords. This had the effect of evicting scores of local Palestinian tenant farmers from these lands – lands upon which their families had lived for generations. Again, under these circumstances these actions made it fairly inevitable that conflict would ensue. Re your analysis of terrorism, no one disputes that terrorism is wielded to “sow fear.” But as most analysts (including Zakaria) point out, terror is ultimately utilized in order to achieve quite rational political objectives. Anti-terror policies that fight terror exclusively through military means – without addressing the political dimensions of these conflicts are inevitably bound to fail. Yes through the turn of the century, Zionist settlers bought up land throughout Palestine, predominantly from Arab absentee landlords. This had the effect of evicting scores of local Palestinian tenant farmers from these lands – lands upon which their families had lived for generations. How about a citation to credible historical source for this notion? And I don’t mean Ilan Pappe who admits that he subordinates facts to his political convictions. Arab violence against Jews before 1948 was mostly directed against members of the old Yishuv in Jerusalem, Jaffa and Hebron, who were every bit as indigenous as the Arabs. Strange that they were less interested in attacking the people displacing them than those with whom they had lived in such harmony. Strange that the Arab population was growing so rapidly during this period of displacement. The eviction of Palestinian farmers due to Zionist land purchases in well-documented in the public domain. It’s also important to note that due to the Zionist “Hebrew only” labor policy, evicted Arab farmers became increasingly unable to find work, creating widespread unemployment for their community. “Actually the result of the purchase of land in Palestine by the Jewish National Fund has been that land became extra territorial. It ceases to be land from which the Arab can gain any advantage either now or at any time in the future. Not only can he never hope to lease or cultivate it, but, by the stringent provisions of the lease of the Jewish National Fund, he is deprived forever from employment on the land” (p. 56). “The policy of the Jewish Labour Federation is successful in impeding the employment of Arabs in Jewish colonies and in Jewish enterprises of every kind. There is therefore no relief to be anticipated from an extension of Jewish enterprise unless some departure from existing practice is effected” (p. 133). “It is impossible to view with equanimity the extension of an enclave in Palestine from which the Arabs are excluded. The Arab population already regards the transfer of lands to Zionist hands with dismay and alarm. These cannot be dismissed as baseless in light of the Zionist policy described above” (p. 135). Your claim regarding Arab violence against Jews pre-1948 is simply untrue. (I’d be curious to see your primary historical source for that one.) It is well-documented that Arab guerrilla warfare spread to rural areas throughout the 1930s. With all due respect, Gil, I believe it is you who is subordinating facts to your political convictions.